Have you ever browsed Gilt.com, Living Social, and Groupon for teeth whitening deals, and then were disappointed after you saw how much it would cost to get the procedure done? 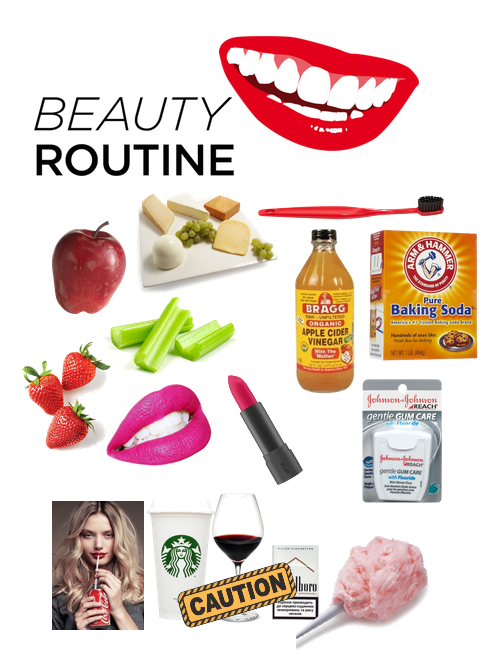 I recently discovered I can get really great results for whiter teeth, by doing a few things myself at home. Check out these tips to get affordable whiter teeth in no time! EAT VEGGIES & FRUIT: Not only are they healthy alternatives for your body but also for your teeth. Crunchy and crispy fruits possess the ability to lift stains from the teeth and give the illusion that they are whiter. Think of it as a different type of tooth brush. According to Health.com, strawberries contain malic acid, which acts as an astringent to remove surface discoloration on your teeth. Crush the strawberry to a pulp like consistency and combine with ½ tablespoon of baking soda. Add it to your teeth and leave it on for 3-5 minutes and then rinse. SAY CHEESE: I recently read online that cheese after a meal can help prevent tooth decay. Researchers think cheese may help because it forces the mouth to produce more saliva, and compounds in cheese may adhere to teeth and protect them from acid. I love cheese so this was music to my ears. SWAP OUT YOUR TOOTHBRUSH: It's been quite a long time since you purchased a new toothbrush and it might be time to change it if you want to see bright white teeth. You should change the head of your electric toothbrush or purchase an entirely new one at least every two to three months. Otherwise, you're just transferring bacteria to your mouth. TRY APPLE CIDER VINEGAR OR BAKING SODA: Use this in the morning as your toothpaste and then brush as usual. This will help remove stains, whiten teeth, and kill bacteria in your mouth and gums. In a small cup, mix half a teaspoon of baking soda with half a teaspoon of water. Mix to form a paste. Dip your toothbrush into the cup, to cover the bristles with the baking soda paste and brush! FLOSS: Personally I use to hate to floss, my dentist disliked me very much in high school because of that. As an adult, I know how important it is to do it. Carry floss with you between meals and you'll slowly begin to see the benefits of doing this daily. COLOR YOUR LIPS: Did you notice that when you choose a medium coral or red lipstick your teeth appear whiter? These colors make your teeth look whiter, whereas lighter-colored lipsticks tend to bring out the yellow in teeth. GO ON A WHITE DIET: You know that term you are what you eat? Try to stop drinking coffee, black tea, red wine, soda, and smoking cigarettes and you will start the phase of getting whiter results. I know harder said than done, I absolutely love coffee and love wine but test this theory out for a month and see how much progress you can make. Do you have any affordable teeth whitening suggestions? Comment below. 11 comments on "A LIST OF AFFORDABLE METHODS FOR WHITER TEETH "
Great tips! I love trying new things! I'm intrigued by the use of strawberries! That is definitely something I should try! The most effective teeth change of color merchandise tend to be the teeth change of color strips as a result of the strips keep in touch with the teeth for a extended amount of your time, for more information click here teeth whitening 33412.